The Serene Stamper: Back to school = stamping time for YOU! Back to school = stamping time for YOU! Start a stamping group with your friends. Just having someone to stamp with makes it that much easier to make time for stamping. Make it a monthly girls’ night out or a Sunday afternoon alternative to watching football – whatever approach you take, you will also find that stamping with others inspires your own stamping because we all see things differently. Set up a stamping space. It doesn’t matter if it is big or small, but designate a stamping space for yourself somewhere in your house. And if you are able, leave out your stamping supplies, so that you can just pick up where you left off when you have 10 or 15 minutes to do some stamping. No set up or clean up can really help you to make the most of your time. Don’t just think about having your supplies where you can find them (though this is very helpful, of course), but think about how you use your supplies and what inspires you. What makes more sense to you – organizing by color? By type? By theme or holiday or occasion? Having your supplies organized by the way you think makes them that much easier to find and can also be a source of inspiration as you are working. Set aside time for stamping just like you would for an appointment or lunch with a friend. Attend a class or learn something new. Nothing gets us inspired like taking a class or learning something new. If you are looking to make time for stamping, but are finding it difficult, you might just be in a stamping rut. This will get you out and stamping again. Color, design, and pattern inspiration can be found everywhere. Clip pictures from magazines or catalogs. Flag pages in your Idea Book & Catalog (#122202). Make your own color swatches or keep your Color Coach (#121620) handy. Have something to stamp or an idea of something try also creates a reason for you to make time to stamp. Save money and get support. Just as Stampin' Up! demonstrators provide their customers with one-stop shopping and individualized service, Stampin' Up! provides its demonstrators with the opportunity to pursue their individual goals whether those goals are to enjoy a hobby, build a thriving business, or contribute to family income while spending more time at home. You receive a 20 percent discount on Stampin' Up! products. Hopefully you are now even more excited about making time to stamp. It’s time to get back to stamping school and enjoy all that rubber stamping and papercrafting has to offer. 1. Fold Basic Black card stock (3" x 6") in half to form card. 2. Create distressed look by using More Mustard ink pad to on edges of Newsprint Designer Series paper (2-3/4" x 2-3/4") and curling up corners. Adhere to front of card. 3. Stamp medallion image in More Mustard ink, and crown image and sentiment in Basic Black ink on Newsprint Designer Series paper (3" x 3"). Tear two edges and distress with More Mustard stamp pad. 4. Use Scallop Trim Border punch on More Mustard textured card stock (1" x 2"). Adhere to torn piece of Newsprint Designer Series paper. 5. Coat brad in Dazzling Diamond Stampin’ Glitter and attach to crown image. 6. 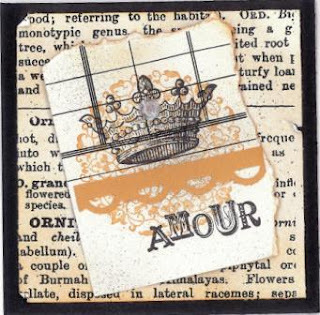 Adhere torn piece of Newsprint Designer Series paper to front of card using Stampin’ Dimensionals.